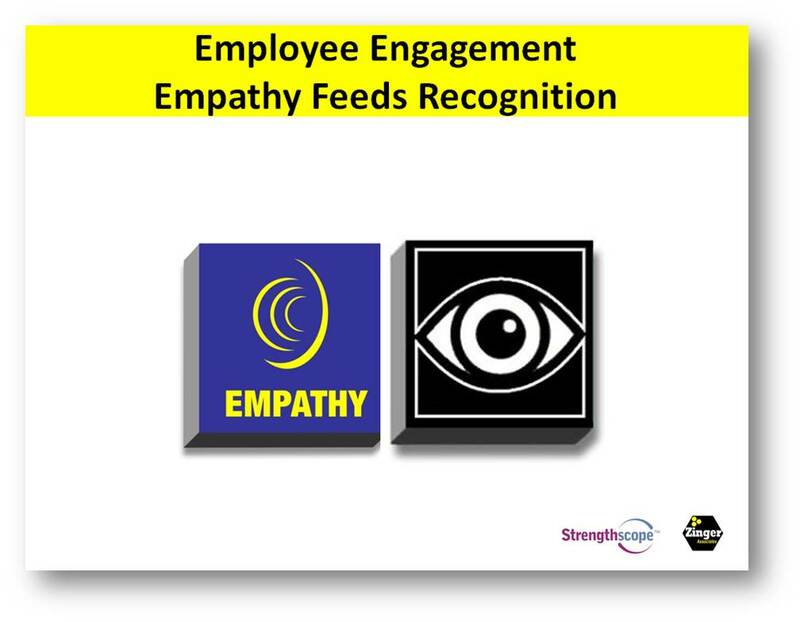 Employee Engagement: Empathy take engagement beyond ourselves. The pyramid of employee engagement is a 10 block model of employee engagement. Here is a link to a 50 page booklet on the pyramid. After completing the strengths inventory, Strengthscope, from Strengths Partnership in the UK, I embarked on a systematic application of my 7 significant strengths to each of the 10 blocks of the pyramid. This will make my engagement work more robust while also enhancing personal wellbeing through the application of strengths in the service of others. In previous posts, I have outlined how all 7 of my strengths can be applied to one of the ten building blocks of employee engagement. In this post I will outline how one strength, empathy, can enrich recognition. Empathy is a deep and communicated understanding of another person’s perspective and world. We leave our agenda and view behind to move fully into the the world of another. Empathy is a powerful way of demonstrating caring and caring can also be made tangible through recognition. Empathy add strengths to recognition when we listen to how others want to be recognized and respond accordingly. Some people prefer more personal recognition and shy away from public displays of recognition. When we are empathetic in our recognition we do not give donuts to dieters or parking spots to people who ride the subway to work. I sometimes believe that the failure of not having more frequent and robust recognition stems from a lack of demonstrated empathy. Every day that people work they should be recognized at work. I believe anonymity is an engagement killer while empathy invites us out of disengagement. When the intent of recognition is to communicate that you care about another person at work and that you are paying attention to them, your recognition can also be about gaps and variances in their performance. As you have an engaging conversation about their deficient performance many employees will tell you that it was a good experience to be seen and cared for with tangible help to improve because positive or negative conversations are less about the content of a conversation and more about the intent of the conversation. Empathy gives you good intent! Plan to attend the London UK Strength and Engagement Workshop Wednesday November 28 from 13:00 to 18:00. I will be presenting/facilitating on the Pyramid of Employee Engagement and Michael Farry, HR Director for PhotoBox, will also be presenting on how to build a culture of positive leadership, collaboration and innovation through a systematic, practical and integrated change and development programme. Next Post in the Series: Employee Engagement: Working with the Moments of Strength. David Zinger is an employee engagement expert. He will be in the UK in late November to support the Go Live event for the UK Employee Engagement Task Force and to co-lead an afternoon workshop on the fusion of employee engagement and strengths for innovation and excellence.